The Centurion Conference & Event Center is the premier event venue in the Ottawa area. Our modern, multi-functional conference and banquet facility offers over 14,000 square feet of newly renovated space that is capable of accommodating up to 800 attendees. Our event space features nine bright and well-designed meeting rooms that range from 312 sq. ft. boardrooms to 3240 sq. ft. halls. We can accommodate a number of setups, from theatre, u-shape, hollow square, boardrooms, exhibits, classrooms, and dinner rounds. Each of our rooms will come set up with professional-looking tables and chairs decorated with white linen and will include water for your guests. We offer full catering services with custom menus for your meeting or corporate event. With a wide range of delicious menu options and packages, our options are sure to offer something for every taste, event idea, and budget. You can review our Corporate Menus page to explore all the available options. Our central location is just minutes away from the Ottawa International Airport, hotels, restaurants, golf clubs, and conveniently accessible via major highways. We also offer free on-site parking. 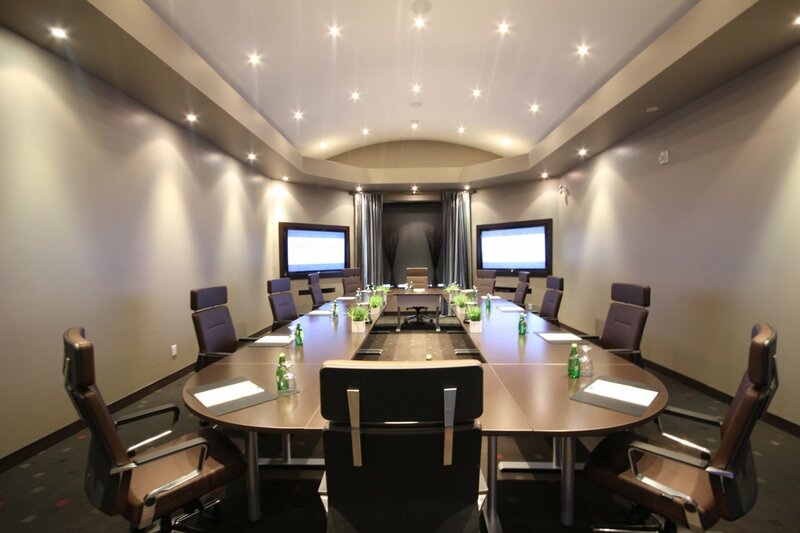 The Centurion meeting rooms and corporate event space features state-of-the-art technology in-house, including HD and 4K TVs, Apple TVs for wireless connectivity to Apple devices, free WIFI, and a built-in PA system. If you need a podium and microphone, dedicated phone line, fax and photocopier service, or AirPrint printing, we have you covered! For additional AV requests like teleconferencing, large projector screens, flip charts, and Polycom speaker phones, we are partnered with a local Audio-Visual rental company who can provide all of your technological needs at discounted rates. Every guest that visits the Centurion Conference & Event Center can expect professional and attentive service from our dedicated staff. The expertise of our Sales team along with the dedication and efficiency of our Service Staff will guarantee that your event runs smoothly. We’ll work hard to surpass your expectations and to ensure that your guests’ experience is enjoyable and unforgettable. When you’re looking for professional event planning, exceptional food, modern technology, passionate customer service, and a corporate ambience, look no further. Centurion Conference & Event Center is the ideal space for conferences, meetings, and social events. Please see our “Corporate Menus” page, where you can find corporate event pricing information. Feel free to call our Corporate Events Manager at 613-727-1044.